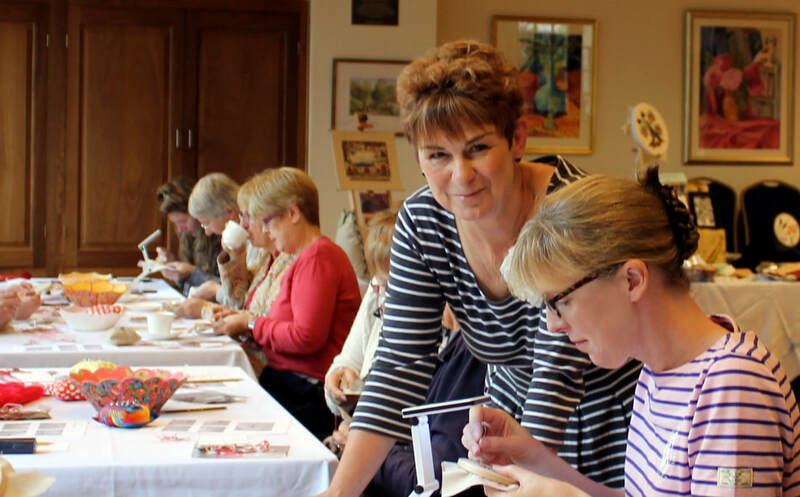 I am Cathy Reavy and my hand embroidery workshops are based in the beautiful village of Alstonefield in the Peak District National Park. It's important to me that you feel inspired, relaxed and encouraged by your experience on a workshop. "It's like a Spa day without taking your clothes off", said a regular attendee! I aim to deliver creative, high quality workshops that are affordable and friendly. You won't be given a 'shopping list' of things to bring with you - everything is provided, including my home-made cakes & biscuits served by my husband, John. With a love of travel, I am keen to revive embroidery traditions and techniques from around the world and I love to create my own designs whilst working out the most straightforward methods of teaching. Beginners are welcome and encouraged, but I cater for a wide range of abilities. I also try to keep the 'admin' simple - reserve a place on any full day or evening workshop without obligation and pay at any time up to 6 weeks beforehand. Threads was founded in 2012 and it continues not only because I love what I do, but because of the fantastic response I have received from the people who have attended the workshops over the years. And as a result of a holiday in 2018, we have been pleased to sponsor Waterberry Community Projects supporting educational programmes in rural Zambia, with profits from selected workshops being used to fund the High School fees of a child. To read more about my story, go to Cathy Reavy. Take a look at the current list of workshops by clicking here. Follow me on facebook, instagram & twitter for up to the minute news, photos and items of interest! We are sponsoring Waterberry Community Projects supporting educational programmes in rural Zambia. Profits from Finishing Off Days are used to fund the education of a child at High School under the Tukongote sponsorship scheme. Subscribe to our mailing list. We promise to look after your personal data in accordance with our Data Protection Statement, which can be viewed on our website.